The history of the airfield of the Redstone Arsenal starts at the beginning of World War II when was created with the purpose to assist the planes used to test incendiary munitions produced in several centers of the US Army. Once the war ended the airfield remained almost 11 years without being used until Febraury 1956 when was activated at Redstone the Army Ballistic Missile Agency which used the airfield installations. The air station became fully operational and the previous facilities were upgraded with the construction of a control tower and the modernization of radar and communications systems. Its main goal then was to provide support to units working on missile programs being developed there, thus supporting a considerable flow of air traffic. In late 1959, NASA's Marshall Space Center signed a contract with the Army for joint use of facilities at Redstone. The agreement made possible the transfer -at no cost for NASA- of air support and free use of facilities and personnel for various projects of the agency. 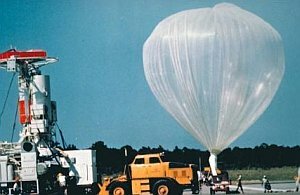 In 1971, the agreement was amended to allow use of the airfield for the operation of stratospheric balloons. Thus, in September of that year there was launched the gigantic space telescope called "Stratoscope II." That was the only and unique balloon launched there. Since then the site has not been used again for that purpose.